7 Kids and Us: Don't throw that dress out just yet! I have learned rarely to look at tags when buying my kids clothes cause most of the time the size might say a 6 but fits my 4 year old or say 4 and fit my 6 year old. That being said I cleaned out clothes for my daughter and realized she had a 6-9 month shirt on, well I guess cause the size it was meant to be a dress. I didn't ever think it was a dress it was her 12 month old shirt which was super cute. It works both ways some of my older daughters shirts make for a cute dress for Sarah. So before you donate that dress think to yourself would this make a cute shirt for when she is older? 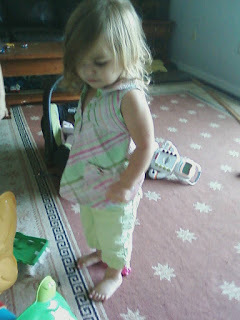 She is wearing what is meant to be a dress for a 6-9 month old lol, it made a great shirt! This is my older daughters 2t shirt made a great dress!